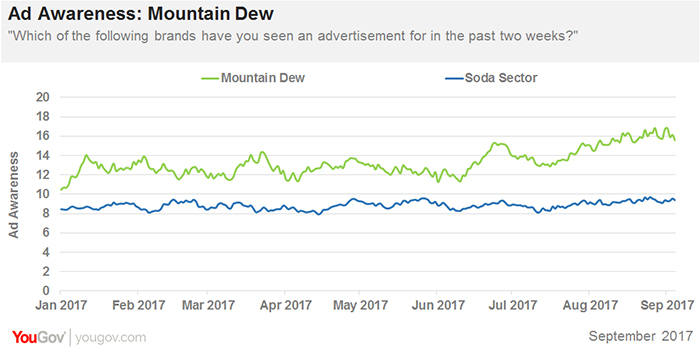 Mountain Dew, a brand with a long history of achieving above-average ad awareness in the soft drink industry, just hit a one-year high and its highest summer mark in three years, according to YouGov BrandIndex. Last Friday, Mountain Dew’s advertising was recalled by 17% of U.S. adults, up from 11% in early June. These results mirror another positive outcome: the brand’s highest purchase consideration score since June 2014, a key indicator of potential sales revenue. Currently, 19% of consumers would consider buying Mountain Dew the next time they want to purchase a soft drink, versus an average score of 15% for the soft drink sector. 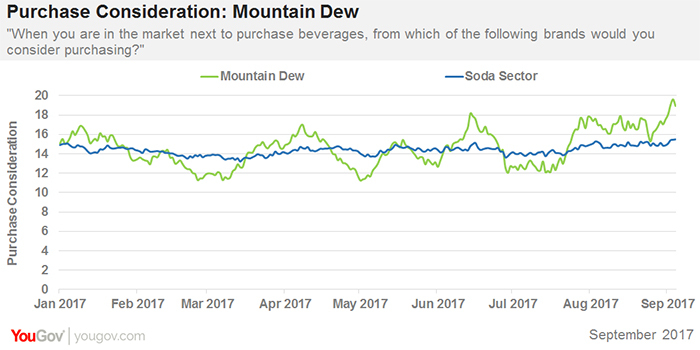 Only several weeks ago in mid-July, Mountain Dew’s purchase consideration was 12%. Last year, Mountain Dew launched its own network of four content creators, resulting in 17.5 million views of videos that were created specifically to tout the Dew brand, the company told Business Insider. The recent launch of two straightforward non-voiceover 15-second ads, “Flip” and “Splash,” emphasizing cold refreshment, with slow-motion bottle caps spinning off in a spray. A new edgy “Dry Mouth” radio spot that debuted in June, asking “Do you even listen to your mouth?” The one-minute ad launched a major discussion on Reddit. The late May debut of a TV infomercial parody starring NASCAR driver Dale Ernhardt Jr.